We assume responsibility immediately after the customer's check-out in your online shop: we pick up the ordered goods from your central warehouse or your branch and deliver them by train to the different Swiss cities. Then, our cargo bike couriers either deliver your packages directly or bring them to a notimePICK point. All the process, from the order in the online shop to the delivery of the goods and everything else involved, is fully automated and highly-optimised by our system. Are you interested in working with notime? Do you have any questions about our company or our offers? Do you have an interesting project idea that you would like to discuss with us? Whether you are looking for a full-service solution for your logistics or just want to use part of our range, we have the perfect solution for every online shop. Our unique last-mile offer: Starting from our notime hubs in Zurich, Winterthur, Basel, Lucerne, St. Gallen, Geneva and Lausanne, we deliver your e-commerce packages within two to three hours on super efficient mini tours. It’s entirely up to you whether you offer same day or next day delivery, home delivery or delivery to a notime collection point. Offer your customers the highest level of flexibility. The notime full service: We not only distribute your e-commerce packages over the last mile, we also cover the first mile and line haul for you. When same day delivery is not fast enough: Use our instant delivery option and we will pick up your parcels at a city hub or branch office and deliver them to you within 90 minutes. Our restaurant delivery service: We also offer an instant delivery option for your food and ensure that your hungry customers are served in the shortest possible time. 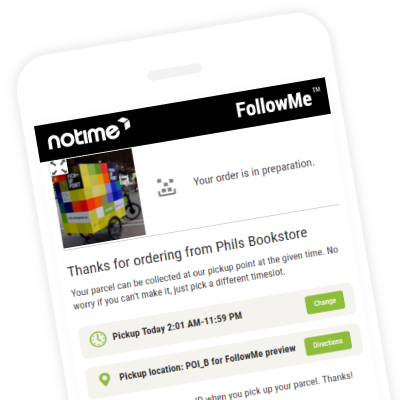 Allow your customers to track their deliveries in real time thanks to our notime FollowMe: The ultimate delivery experience! It doesn't matter whether the delivery is to be carried out immediately or later on, notime provides your customers with several delivery times at the check-out. The deliveries can also be tracked in real time using FollowMe, and delivery time and location can be changed right up until the last moment. 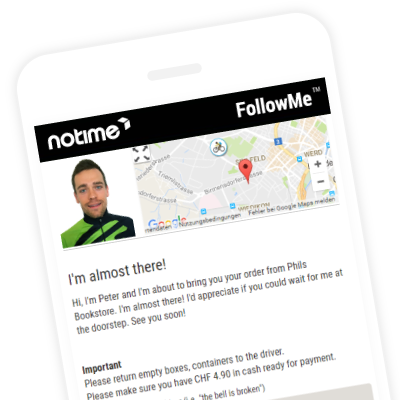 Imagine you have a friendly and attentive butler who follows you everywhere, and brings your orders on a silver platter at just the right time... Our notime FollowMe turns this wish into a reality: your customer receives an SMS with a link to a mobile-friendly FollowMe page for every notime order. On this page you can follow the delivery of the package live, and the delivery time and location can be adjusted if desired. Your customers can change their chosen time slot easily - within the same day, or at any later time. Also the delivery location can be changed with just a few clicks. Your customers can track our notime couriers on a map as soon as they're approaching the drop-off. Your customers' feedbacks help us to constantly improve our service. If your customers aren't able to make it home in time, they can also have their parcels delivered to one of our pick-up points at various Swiss stations. 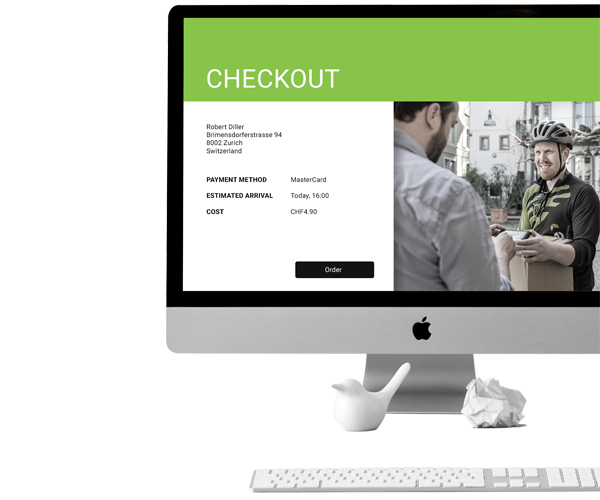 Integrate notime delivery services into your checkout process by connecting your online shop to our platform via REST API or WebWidget, regardless of whether you work with Magento, Shopify, or any other shop system. Both variants have been purposely designed to be as simple as possible to implement. You will be ready to start in no time! Log into our notime Service Manager, click on the cogwheel symbol, and select «notime Button - WebWidget» to create your own button. Add a simple "Approve" HTML post statement to your website where the order is completed. Pressing the button below will cause a sample pop-up to appear, showing the possibility of selecting different delivery times. This is just one of the many configuration options you can choose from. Furthermore, the pop-up can be customised exactly as you want it and in accordance with your branding guidelines. Sign up here for a fully functional test account. After registering, sign up for here our test product. 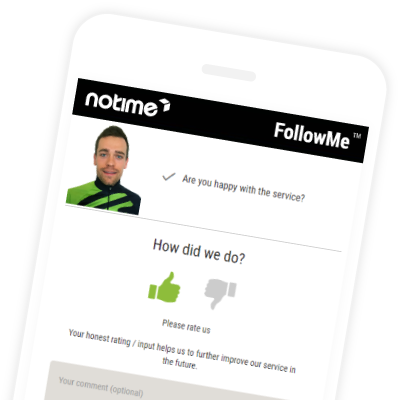 Contact us at info@notime.eu so that we can help you start your delivery with notime and create the best possible shopping experience. Here you will find a simple PHP script that shows you how orders are delivered to notime. If you also run a Magento shop, you may also like our notime Button. Use our notime API for Ruby on Rails projects. Everything you need for the implementation is ready for download here.